Submit your information and a product specialist will contact you within 24 hours to schedule a live demonstration. C&S Companies' Q Ware facilities maintenance software is designed to be simple to understand, easy to use, and flexible enough to accommodate a range of users across different industries. If you are a maintenance manager of buildings, assets, or equipment and operate under a small to medium-sized organization you will benefit from our simple solutions. Mix and match our five CMMS software modules so you only pay for the features you want (work order management, preventive maintenance scheduling, inventory management, asset management, and event scheduling modules). The CMMS System is completely web-based meaning you can access it anytime and from anywhere there is an internet connection. It's also a mobile friendly application. Pricing is based on the modules required and the number of users (1-5 users or 6+). Free standard subscription features include: unlimited support, unlimited training, unlimited requestors, free customization, mobile work order management, 100% no-effort setup, unlimited data storage and more. World class, turn-key setup means the software is populated with data and ready to go from the first day of use. Manage your corrective maintenance work requests with an online submission system that keeps your work organized. 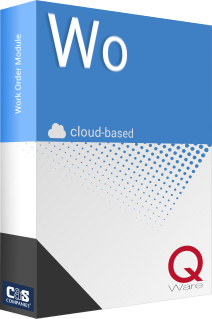 Work can be assigned prioritized, tracked, and reported on with this simple work order software module. Need to automate your work orders? The Q Ware preventive maintenance module empowers users to create timed schedules for work orders to be created. PM work orders are tracked against equipment and automatically send email notifications when they are created. Never sure what you have in inventory or when it's time to order more? The inventory management module keeps a working database of maintenance consumable inventory where items can be tied to completed work orders and consumed. It comes with extensive reporting as well. Are you a Facility Manager or IT Professional looking to track your assignable assets? The Q Ware asset management module was designed to do just that. Users can assign, depreciate, track work histories, and report against these mobile assets. Designed specifically for schools and municipalities, the Q ware event scheduling module manages the use of facility locations through a simple scheduling calendar that has a built in conflict checking tool. Scheduled events are tied to the work order module to help with prep and setup.